Download "LEGACY REPORT. www.icc-es.org (800) 423-6587 (562) 699-0543 A Subsidiary of the International Code Council. *Corrected March 2014"
2 PFC-3700 Most Widely Accepted and Trusted Page 2 of 9 4 hours. The same panels have an unrestrained assembly fire resistance rating of 1 hour when the reinforcing in the panels has a minimum cover of 7 / inch (19.1 mm). Panel joints are reinforced with No. 3 deformed steel reinforcement bars and packed with normal-weight concrete. For restrained assemblies, perimeters are restrained by ring beams measuring inches (152 mm) wide by the depth of the panels. The ring beams are reinforced with two No. 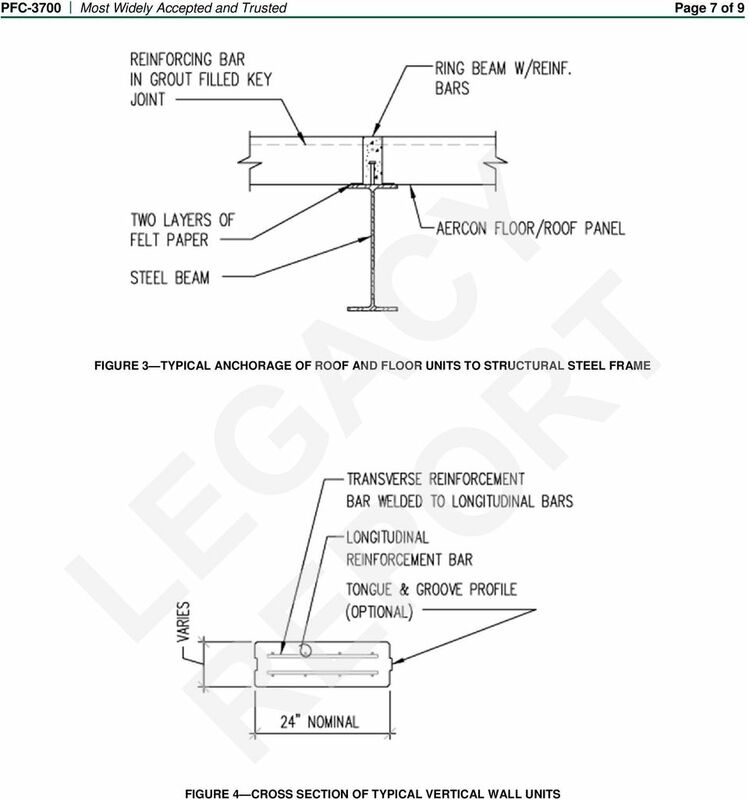 4 deformed steel reinforcement bars, placed at one-third and two-thirds the depth of the beam; and consist of normal-weight concrete with f c = 3,000 psi (20.7 MPa). The loading is calculated in accordance with Section and is limited to 1 psf (5.3 kpa) live, 145 psf (.9 kpa) total Curtain Walls: All units are nonbearing and are designed to resist wind loads as set forth in Table of this report. Wall units have two layers of equal reinforcement and are placed with longitudinal edges either vertical or horizontal. Wall units placed vertically are produced with tongue-and-groove vertical edges as shown in Figure 4. 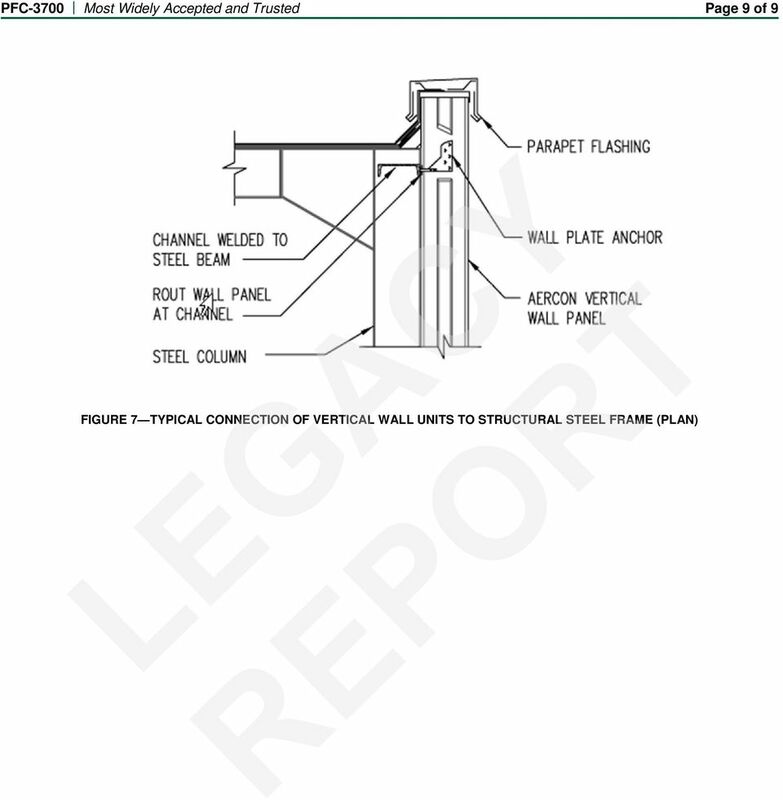 Typical connections to structural steel are shown in Figures 5, and 7 of this report. 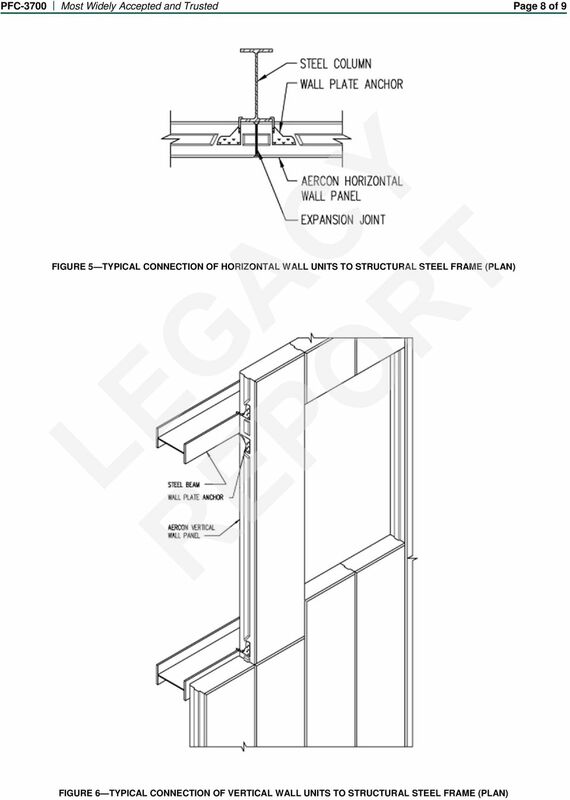 Exterior panels and their connections must comply with the requirements of Section 132 and 133 of the UBC or Section 121 of the IBC. Typical connections are intended as a guide only, and when used must be substantiated by structural calculations or other data submitted to and approved by the building official. Typical exterior surface treatment involves the application of two coats of water-repellent, but not impermeable, acrylic paint. The first coat is brushed on and the second, containing coloring and optional mineral grains for texture, is roll- or spray-applied. The joints are painted prior to treatment of the surface, after which an elastic sealing compound is applied to expansion joints. Interior surfaces must be given an initial sand spackle coating before the surfaces are painted or wallpapered Partition Panels: General: These panels are nonload-bearing and are designed for 5 psf (34 kpa) lateral loads perpendicular to the surface. The panels are 24 inches (0 mm) wide; 3 or 4 inches (75 mm or 2 mm) thick; are available in lengths between 7 feet and feet (2134 mm and 304 mm), in 2-inch (51 mm) increments; and have a rectangular cross section with reinforcement placed at mid-depth. Partition panels must be joined with a cement-based adhesive provided by the manufacturer. Adequacy of connections to ceilings and floors must be justified by structural calculations or other data submitted to and approved by the building official Fire Resistance: The 4-inch-thick (2 mm) Category ACR4 panels have a three-hour fire-resistance rating in a nonload-bearing configuration. The panels must be installed vertically, and the joints must be mortared using AERCON mortar described in Section The exterior and interior surfaces need not be coated or covered with any other finishing materials. Horizontal steel reinforcement is minimum W-3 smooth wire, spaced 4 inches (1219 mm) on center, and vertical steel reinforcement is minimum W-2 smooth wire, spaced 12 inches (305 mm) on center. Reinforcement must be centered in the panel Miscellaneous: Precast units must be at least 12 inches (305 mm) above adjacent grade unless appropriately protected from absorption of moisture. Grooves for electrical wiring and holes for junction boxes are permitted to be cut or routed on-site when substantiated by structural calculations. Openings in roof and floor panels that are field-cut must have additional reinforcement substantiated by structural calculations or other data. 2.3 Precision Blocks: General: The AERCON Precision Blocks are solid blocks manufactured from the same material and by the same method as used for the AERCON reinforced panels. The blocks are used for either reinforced or nonreinforced, exterior or interior, load-bearing or nonload-bearing walls. 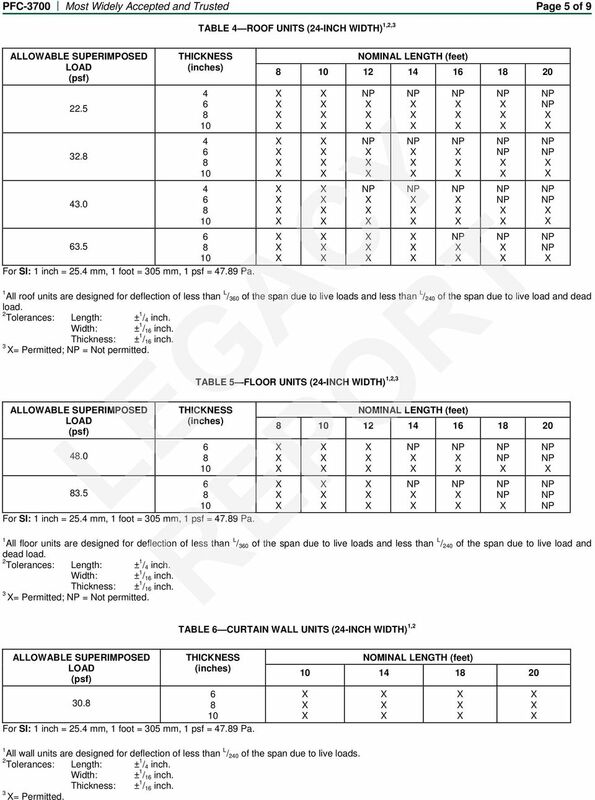 The dimensions for the blocks are presented in Table 1 of this report. The tolerances are 1 / 1 inch (1.5 mm) for all dimensions AERCON Thin-bed Mortar: AERCON Precision Blocks are laid with a proprietary AERCON thin-bed mortar, supplied in a dry, ready-to-mix form, containing fine sand and/or crushed marble, cement, lime and plasticizing and water-retaining additives. Packaged in 55-pound (25 kg) bags, the mortar has a shelf life of 12 months. Each bag is combined with 1.75 gallons (. L) of clear water and mixed for two minutes. The mortar has a minimum compressive strength of 1,000 psi (.9 MPa) at 2 days. The mortared joints are approximately 1 / 1 inch (1.5 mm) thick Design: The structural design must comply with Chapter 21 of the UBC or ACI (IBC). 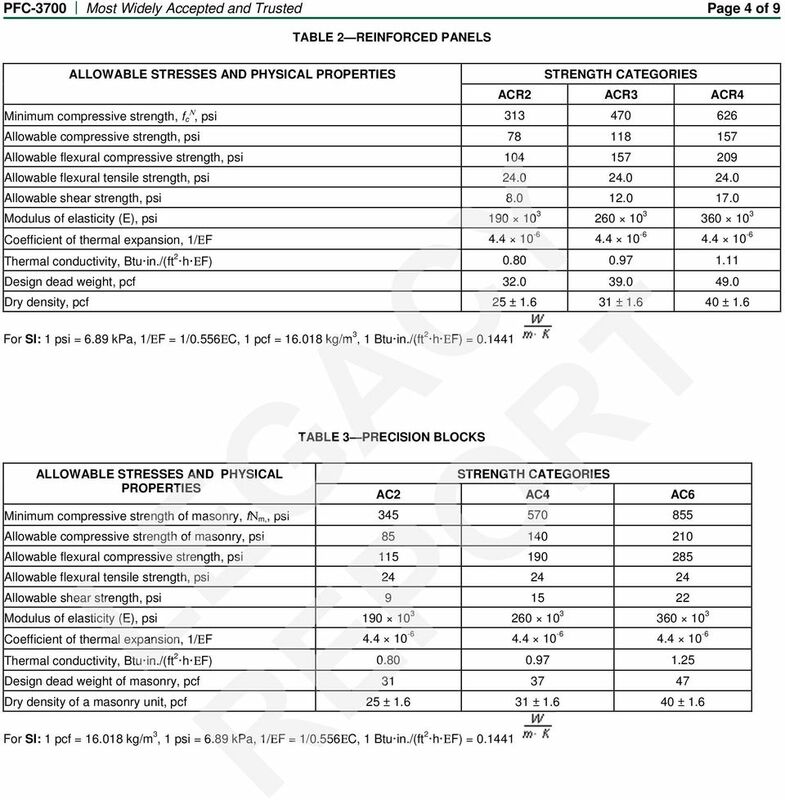 Allowable design stresses and properties are presented in Table 3 of this report. Use of AERCON Precision Blocks as a portion of the structural frame is limited to Seismic Zones 0 and 1(UBC) or Seismic Design Category A (IBC) Exterior and Interior Protection: Cementitious stucco or other approved exterior wall claddings need to be applied over exterior walls. The interior surfaces need to be coated with cementitious or gypsum-based plaster or other interior wall finishes. Basement walls must be built with strength class AC4 or AC Precision Blocks only. For this application, precautions must be taken to allow for the drying of the wall. This is achieved either by applying impermeable protection below-grade on the outside, in which case heat-drying takes place toward the inside, or by applying a noncapillary air-permeable cover (e.g., mineral wool mat) on the outside, below ground level. In the latter case, the drying takes place through both sides of the basement wall Fire Resistance: The minimum -inch-thick (200 mm) Precision Blocks have a bearing wall fire resistance rating of 4 hours and a nonbearing wall fire resistance rating of 4 hours. The density of the Precision Blocks must be 25 to 43 pcf (400 to 50 kg/m 3 ). The Precision Blocks must be laid in a running bond, and the head and bed joints mortared with AERCON mortar. For bearing walls, the load must be calculated in accordance with Section 2.3.2, and is limited to 11,50 plf (1.7 kn/m). 2.4 Installation: The units must be installed in accordance with this report, and the UBC or the IBC, as applicable, and with the approved structural plans. Copies of the plans and this report must be available at the jobsite at all times during installation. The instructions within this report must govern if there are any conflicts between the manufacturer s instructions and this report. 2.5 Special Inspection: UBC: Special inspection of concrete reinforced panels, structural masonry precision blocks, and fastener placement shall conform to Section of the UBC. 3 PFC-3700 Most Widely Accepted and Trusted Page 3 of IBC: Special inspection of concrete reinforced panels, structural masonry precision blocks, and fastener placement shall conform to Section 1704 of the UBC Inspector s Duties: The special inspector s duties include verifying panel, masonry unit and mortar identification; panel and unit placement; mortar preparation; and application. 2. Identification: All panels produced in accordance with this report bear the name of the manufacturer (Aercon Florida, LLC), the piece mark number, the strength class, and the evaluation report number (ER-3700). Each cube or pallet of Precision Blocks produced in accordance with this report bear a label with the strength class, and the evaluation report number (ER- 3700). Mortar is identified with the product name, manufacturer s name (Aercon Florida, LLC) and address, weight, mixing instructions, and evaluation report number (ER-3700). 3.0 EVIDENCE SUBMITTED Data in accordance with the ICC-ES Interim Criteria for Concrete and Concrete Masonry Walls (AC15), dated June 2003; reports of tests in accordance with UBC Standard 7-1 (ASTM E119); and a quality control manual. 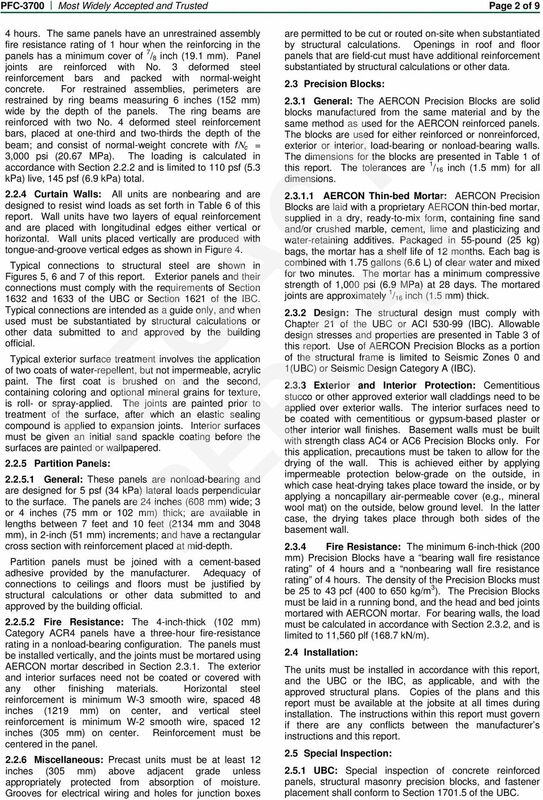 4.0 FINDINGS That the AERCON Autoclaved Lightweight Concrete Panels and Precision Blocks described in this report comply with the 1997 Uniform Building Code and the 2000 International Building Code, subject to the following conditions: 4.1 Material is permitted where noncombustible materials are required. ITEM NO. PRODUCT TABLE 1 PRODUCTS AVAILABLE All units are designed in accordance with the applicable code, using the allowable stresses in this report. 4.3 Design calculations and details for specific applications are furnished to the building official, and verify compliance with this report and the applicable code. 4.4 Panels are produced by Aercon Florida, LLC, at 3701 County Road 544 East, Haines City, Florida, with inspections by ICC-ES. 4.5 Data establishing compliance of Precision Blocks with the density compressive strength requirements for each class as described in this report accompanies each shipment and is submitted to the building official for each project. 4. 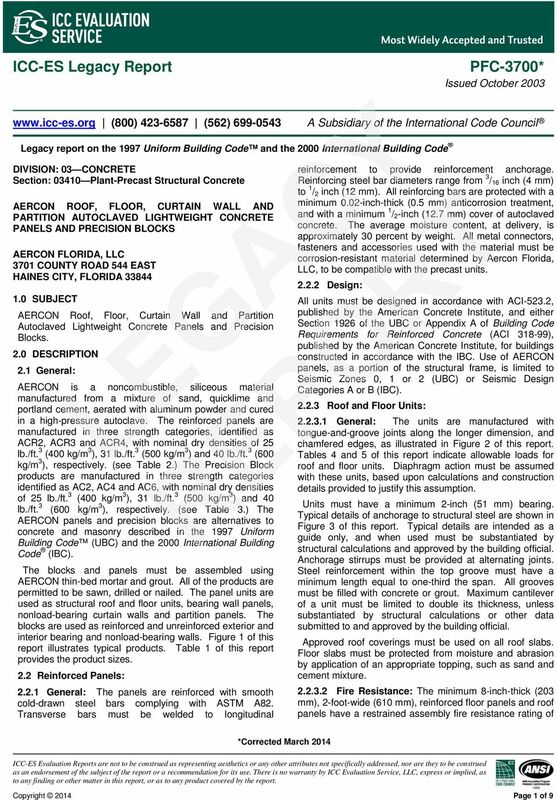 Inspection and installation of AERCON Reinforced Panels complies with the requirements set forth in the applicable code for precast concrete inspection, including special inspection described in Section 2.5 of this report. 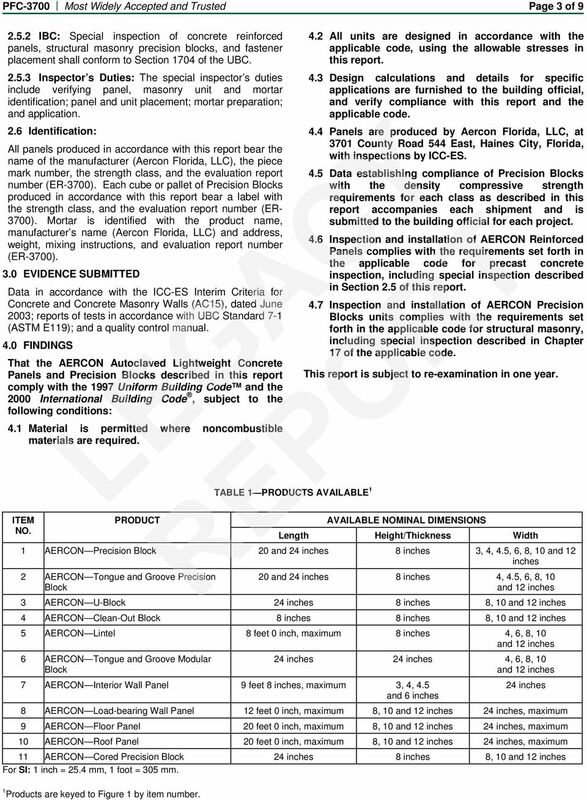 4.7 Inspection and installation of AERCON Precision Blocks units complies with the requirements set forth in the applicable code for structural masonry, including special inspection described in Chapter 17 of the applicable code. This report is subject to re-examination in one year. AVAILABLE NOMINAL DIMENSIONS Length Height/Thickness Width 1 AERCON Precision Block 20 and 24 inches inches 3, 4, 4.5,,, and 12 inches 2 AERCON Tongue and Groove Precision Block 20 and 24 inches inches 4, 4.5,,, and 12 inches 3 AERCON U-Block 24 inches inches, and 12 inches 4 AERCON Clean-Out Block inches inches, and 12 inches 5 AERCON Lintel feet 0 inch, maximum inches 4,,, and 12 inches AERCON Tongue and Groove Modular Block 24 inches 24 inches 4,,, and 12 inches 7 AERCON Interior Wall Panel 9 feet inches, maximum 3, 4, inches and inches AERCON Load-bearing Wall Panel 12 feet 0 inch, maximum, and 12 inches 24 inches, maximum 9 AERCON Floor Panel 20 feet 0 inch, maximum, and 12 inches 24 inches, maximum AERCON Roof Panel 20 feet 0 inch, maximum, and 12 inches 24 inches, maximum 11 AERCON Cored Precision Block 24 inches inches, and 12 inches For SI: 1 inch = 25.4 mm, 1 foot = 305 mm. 1 Products are keyed to Figure 1 by item number. 5 PFC-3700 Most Widely Accepted and Trusted Page 5 of 9 TABLE 4 ROOF UNITS (24-INCH WIDTH) 1,2,3 ALLOWABLE SUPERIMPOSED LOAD (psf) THICKNESS (inches) For SI: 1 inch = 25.4 mm, 1 foot = 305 mm, 1 psf = 47.9 Pa. NOMINAL LENGTH (feet) All roof units are designed for deflection of less than L / 30 of the span due to live loads and less than L / 240 of the span due to live load and dead load. 2 Tolerances: Length: ± 1 / 4 inch. Width: ± 1 / 1 inch. Thickness: ± 1 / 1 inch. 3 = Permitted; = Not permitted. ALLOWABLE SUPERIMPOSED LOAD (psf) TABLE 5 FLOOR UNITS (24-INCH WIDTH) 1,2,3 THICKNESS (inches) For SI: 1 inch = 25.4 mm, 1 foot = 305 mm, 1 psf = 47.9 Pa. NOMINAL LENGTH (feet) All floor units are designed for deflection of less than L / 30 of the span due to live loads and less than L / 240 of the span due to live load and dead load. 2 Tolerances: Length: ± 1 / 4 inch. Width: ± 1 / 1 inch. Thickness: ± 1 / 1 inch. 3 = Permitted; = Not permitted. TABLE CURTAIN WALL UNITS (24-INCH WIDTH) 1,2 ALLOWABLE SUPERIMPOSED LOAD (psf) THICKNESS (inches) 30. For SI: 1 inch = 25.4 mm, 1 foot = 305 mm, 1 psf = 47.9 Pa. NOMINAL LENGTH (feet) All wall units are designed for deflection of less than L / 240 of the span due to live loads. 2 Tolerances: Length: ± 1 / 4 inch. Width: ± 1 / 1 inch. Thickness: ± 1 / 1 inch. 3 = Permitted. ICC-ES Evaluation Report Reissued March 1, 2011 This report is subject to renewal in one year. DIVISION: METALS SECTION: METAL FASTENINGS SECTION: STEEL DECKING REPORT HOLDER: HILTI, INC.
DIVISION: WOOD, PLASTICS AND COMPOSITES SECTION: NAILS REPORT HOLDER: HY-TEK FASTENERS INC.
DIVISION: THERMAL AND MOISTURE PROTECTION SECTION: FACED PANELS REPORT HOLDER: KMEW CO., LTD.
TABLE OF CONTENTS. Roof Decks 172 B, BA, BV Deck N, NA Deck. Form Decks 174.6 FD,.6 FDV Deck 1.0 FD, 1.0 FDV Deck 1.5 FD Deck 2.0 FD Deck 3. DIVISION: METALS SECTION: METAL FASTENINGS REPORT HOLDER: GRABBER CONSTRUCTION PRODUCTS, INC.
A. Section Thermal and Moisture Protection. D. Section Operation and Maintenance of Thermal and Moisture Protection. Wall Framing Technical Guide. LP SolidStart LSL & LVL. 1730F b -1.35E and 2360F b -1.55E LSL 2250F b -1.5E and 2900F b -2.0E LVL. 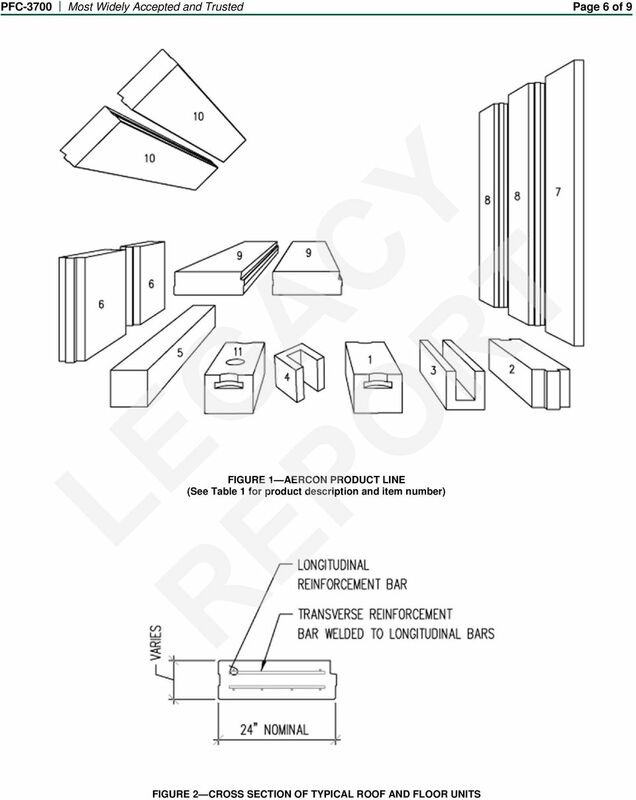 U.S.
DIVISION: 10 00 00 SPECIALTIES SECTION: 10 73 00 PROTECTIVE COVERS REPORT HOLDER: METALS BUILDING PRODUCTS/LATIUM USA TRADING, INC. THE DOW CHEMICAL COMPANY Issued: August 1, 2008 200 LARKIN CENTER 1605 JOSEPH DRIVE MIDLAND MICHIGAN 48674 (989) 638-8655 www.dowbuildingmaterials. ESR-1190 Reissued December 1, 2009 This report is subject to re-examination in two years. ICC-ES Evaluation Report. ESR-3493 Reissued September 2014 This report is subject to renewal September 2015.